Working on a recipe that calls for dill weed or dill seed? If you don't have any on hand, there are several things that you can use in its place, including other forms of dill, tarragon, celery seed or caraway seed. Here's how to make a successful substitution, using what you have on hand. Dill weed is sometimes also referred to as dill leaves. It's the bright green, feathery fronds of the dill plant. It's highly aromatic, and tastes of caraway or anise, with a bit of citrus thrown in. When fresh dill is being used to flavor a recipe (as it is in pickles, soups, and sauces), use fresh tarragon in its place. To make the proper substitution, use an equal amount of fresh tarragon for the fresh dill, or dried tarragon for the dried dill. You can also use dried tarragon as a stand-in for fresh dill weed, but you'll need to adjust the quantities, as it has a more intense flavor. Use one teaspoon of dried tarragon for every tablespoon of fresh dill called for in a recipe. Tarragon works well as a substitute for dill in seafood dishes and in salad dressings. 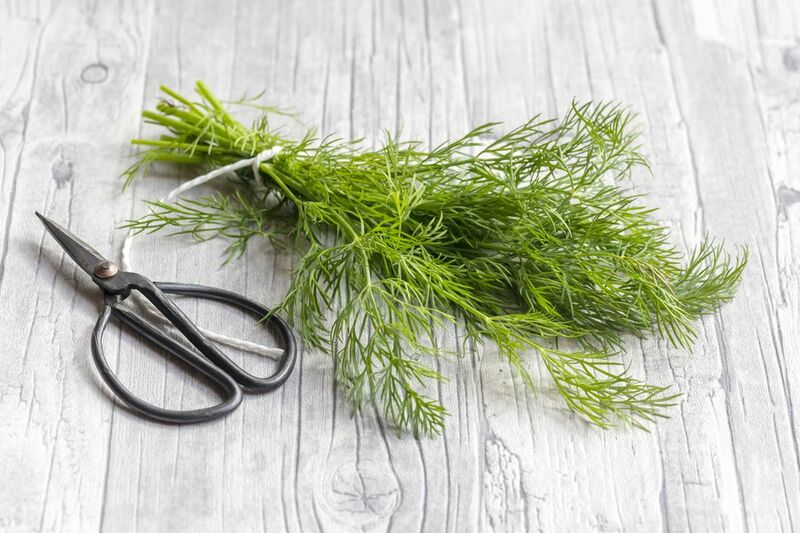 If dill weed is being used as a garnish for a dish, use fennel fronds instead. They look very similar. Fresh parsley can also be used as a garnish. It looks a bit different, but will still add that pop of green. If you don't have either, just leave the garnish off, or get creative with whatever you have on hand. Dill seeds taste similar to dill weed, but they have a slightly bitter edge to them. They appear frequently in pickles, bread, salad dressing, and soup recipes. While you might be tempted to use dill weed as a substitute for dill seeds, you'll get better results if you use caraway seeds or celery seeds in their place. Replace them measure for measure, and you should come close to the intended flavor. Dill is incredibly easy to grow, so consider adding it to your garden. It's an annual, but it reseeds readily. Just allow some of the flowers to go to seed at the end of the season, and it should come up on its own next year. The dill flowers, stems, leaves​, and seeds are all edible. Enjoy it fresh, while it's in season. Then, dry or freeze your extra dill, so you'll have a stash to draw from while it's out of season. For the best flavor, pick your dill early in the morning.